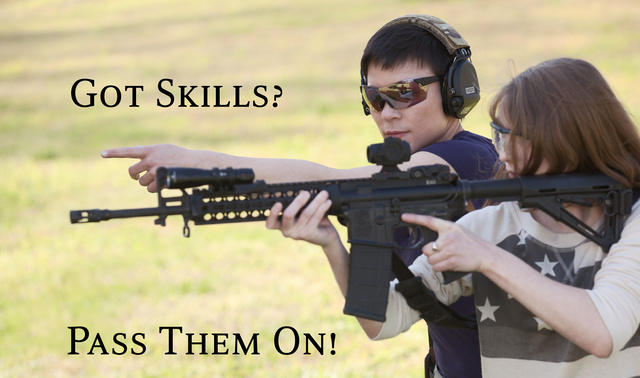 Gun safety, effective marksmanship, and the ethics governing the use of such skills. This entry was posted in interesting people, rifle, training, weapon and tagged AR15, girl, instructor, woman. Bookmark the permalink. 8 Responses to Teach the next generation. Observe the selector switch (SAFE) and trigger finger (OFF). I’d think the instructor has time to move away. They are not as close as they appear, either — it’s an illusion from the use of a tele lens. Been doing such for >30 years now. If you really want to learn how to do something, teach someone else to do it. I hold photo seminars in Nashville or while traveling when people request them. Email me what you’d like to accomplish and we can talk about the details. Photography isn’t my game. My wife has been an award-winning photojournalist for the last 30 years. Good picture and suggestive lead in. W/O doubt the future of gun sports, firearms ownership and training is a motivated young female populace.